Two girls – one Lebanese and one a Syrian refugee - make friends through the Life Skills sessions. Olwen Maynard is a member of the Asia and Middle East team. She tells us how bringing young people together in Lebanon is helping to build trust among local people and Syrian refugees. There’s been a lot of heart-searching in this country about taking in Syrian refugees, and how many would be our ‘fair share’. Something we tend to forget is that most displaced Syrians are still in the Middle East region. Lebanon, a small country with a population of about four million (half that of Greater London), has taken in over a million. Just stop and think about that for a minute. This World Refugee Day donate to our Refugee Crisis Appeal for refugees around the world. Meryata is a place I’d never heard of. It’s a village in northern Lebanon, nowhere near any tourist sites: most of the villagers are Muslims, but the farms round about are mainly owned by Christian families. Nearly 5,000 Syrian refugees have come to live in or near Meryata. They lost everything when they fled their homes, and the amount of assistance they can get from the UN is quite small, so they’re living from hand to mouth. Even so, the little help they do get is, understandably, resented by the local Lebanese, who are not well off themselves, but aren’t entitled to anything from the UN. Meanwhile, the refugee presence is creating huge pressure on social services in the area, rents have shot up, and the refugees are seen as competing with locals for jobs. Such is the suspicion and tension between the two communities that even some of the schools have had to be segregated, with Lebanese and Syrian children taught separately in two shifts. 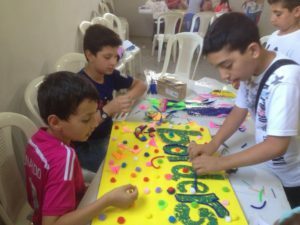 Last summer the Inter-Church Network for Development and Relief (ICNDR), which is one of the programmes of Middle East Council of Churches (MECC), requested funding from CAFOD for a ‘Youth without Borders’ project in Meryata. 60 boys and girls aged 11-16 – half Lebanese, half Syrian – took part in Saturday afternoon activities over four months. Filling the quota of refugee children was a lot easier than convincing Lebanese parents to let their children participate, and the Christian families were particularly resistant. But ICNDR set up a local committee in Meryata, and got the members to talk with the parents and bring them on board. Priority was given to children facing particular difficulties such as family poverty, loss of a parent, falling behind at school, or (in the case of Syrians) suffering war-related trauma. Syrian and Lebanese boys and girls coming together. Four activities were on offer. Participants could choose to do Theatre, for which a really fantastic trainer had been found, someone able to challenge them to break out of their shell and reveal their hidden energy. Another option was Handicrafts, in which they’d be shown how to take a simple item from their homes and turn it into a thing of beauty. Those who went for Life Skills would be given space to express their anger and frustration, and work out how to control them; they’d also learn about trust and co-operation and explore different national traditions. Finally, those who picked Sports would need to overcome their shyness of each other to work together as a team. Suitable premises were found in central Meryata, and a bus went round each Saturday, taking about 15 minutes to collect all the children and bring them to the centre. One ‘problem’ that quickly became apparent was that the internal partitions in the building didn’t go up to the ceilings, so the excited shouting and laughter in one space carried through to the groups on either side who were busy with completely different activities. ICNDR had to ask for something to be put up to block the gaps. Sports sessions were held outside in the yard, and the children were given caps to protect them from the sun, but it was so unbearably hot that awnings had to be fixed up to provide additional shade. 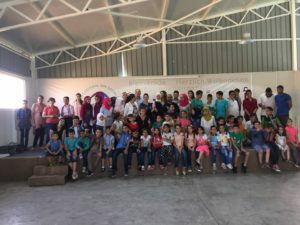 At first the youngsters refused to mix: the Lebanese wouldn’t talk to the Syrians, and the boys and girls also tended to stick in their own groups, but gradually that changed. You could see their confidence and their trust growing, and their creativity even surprised the trainers. ICNDR was bombarded with requests to allow more children to take part, which unfortunately was not feasible. By the end of the four months, it was no longer possible to tell who was Syrian and who was Lebanese: they were all just ‘friends’. Parents and local government officials, invited to the closing ceremony to watch the children demonstrating what they’d learned, were deeply moved and impressed, and friendships formed during the summer continued afterwards. 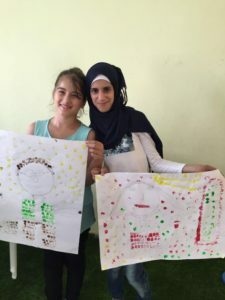 Two girls – one Lebanese and one a Syrian refugee – make friends through the Life Skills sessions. The summer of 2017 is nearly upon us, and CAFOD has made another grant to ICNDR so they can run ‘Youth Without Borders’ again, with a fresh group of children. This World Refugee Day, Tuesday 20 June, donate to our Refugee Crisis Appeal for refugees around the world.